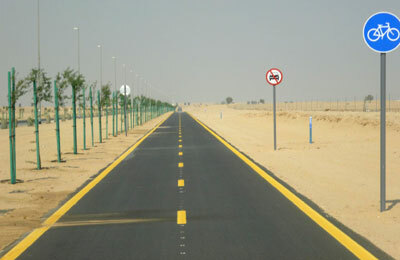 Dubai's Roads and Transport Authority (RTA) has started work on a new 21.2-km-long cycling track in the UAE emirate at an estimated cost of Dh32 million ($8.7 million). The project is intended to connect with the existing cycle path at Seih Assalam running beside Al Qudra Road in the direction of Emirates Road, and further to the Sheikh Mohammed bin Zayed Road up to Nad Al Sheba. Maitha bin Udai, the chief executive of RTA Traffic & Roads Agency, said: "The cycling tracks project had been initiated to cater to the needs of the public identified in a comprehensive study commissioned by the RTA." "The plan envisages the optimal utilisation of cycling paths constructed within the right-of-way, and adopting specific criteria for separating them from vehicular movement through using internationally recognised traffic signs," stated bin Udai. "The project epitomises several strategic goals of the RTA and its plan aimed at providing suitable alternatives to lure Dubai residents and tourists to practice cycling as a hobby," she added.